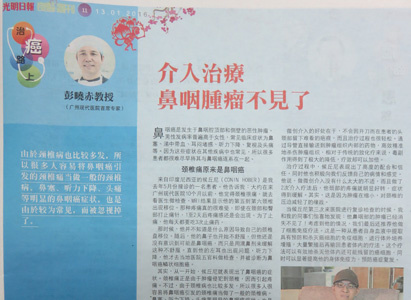 On Jan. 13, Malaysia Guang Ming Daily reported a case of a nasopharyngeal cancer patient COIN HOBER who got interventional therapy and other therapies in Modern Cancer Hospital Guangzhou. And after treatment, his discomforts and nasopharyngeal tumor disappeared. In the report, it also introduced main symptoms of nasopharyngeal cancer to get people’s attention. COIN HOBER, from Indonesia, suffered from neck pain. Even he took painkilling injection and drugs, the pain could not be alleviated. Later, there was something wrong with his nose, but he just used collunarium without realizing nasopharyngeal cancer. Until there were some problems on his hearing, he took examination in ENT (ear, nose and throat) department in the local hospital and was diagnosed with nasopharyngeal squamous-cell cancer. In May, 2015, COIN HOBER was admitted in Modern Cancer Hospital Guangzhou. Professional medical team made a comprehensive treatment plan which was mainly used interventional therapy after check-up. With advantages of no-surgery, small trauma, interventional therapy killed cancer accurately and effectively. After 2 sessions of interventional therapy, his tumor shrank obviously and the compression to cervical vertebra was reduced, and the neck pain was alleviated. During his third time of following-up in Modern Cancer Hospital Guangzhou, his tumor disappeared. In order to improve immunity to fight against cancer cells and prevent cancer recurrence, COIN HOBER took natural therapy, a therapy that the immune cells were collected from the patient’s blood and cultivated in vitro to certain quantity and then infused back to the patient without side effects. Professor Peng from Modern Cancer Hospital Guangzhou indicated that the cervical vertebra pain in COIN HOBER’s case was caused by tumor invasion. Because cervical spondylosis was a common disease, the pain like COIN HOBER’s was easy to be mistaken as the normal. In addition, the symptoms like nasal obstruction, hearing loss, headache etc were also easy to be neglected. In the paper, professor Peng reminded you, when you had continuous dislocation of cervical vertebras with pain like COIN HOBER’s, lasting headache or nasal obstruction, blood in snot, discomforts in ears, hearing loss in succession and those symptoms could not be cured, you should pay attention to the possibility of nasopharyngeal cancer and take check-up to get correct diagnosis and treatment immediately.